When it comes to designing a space, there are various elements of design to consider. We have color, pattern, lighting, shapes, contrast, and proportion to name a few. One occasionally overlooked element of design is texture. Texture is how something feels. It can be soft and smooth or irregular and rough. Some things have physical texture, meaning they physically feel rough or smooth to the touch, while others have visual texture, meaning we perceive what they might feel like based on past memories or experiences with similar surfaces. Infusing texture into a space can add dimension and really affect how a room feels. Texture can make a room feel heavy and weighted or light and airy. Texture can also add interest and add an unexpected touch to what would be an ordinary room. So today we thought we would show you some inspirational images of rooms and spaces where texture plays an important part of the room's overall design. Exposed brick is a great textural element. It both feels and has the appearance of being rough. When paired with sleek antiques and smooth surfaces like hardwood floors, the exposed brick provides added contrast and dimension. 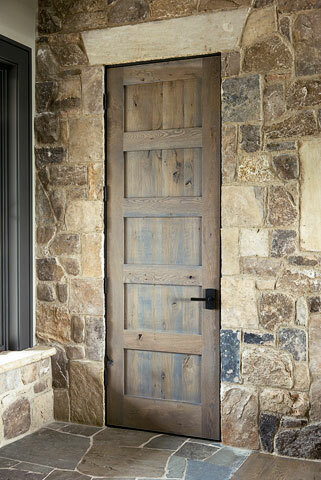 Stone is another textural element that adds weight and interest. In the case of this home, stone was used for both the wall and floors. Given the heavy 'feeling' of stone, it's important to pair it with lighter objects, like wood for the door or wood for the adjoining floors. Adding texture to a space in unique ways is what will really set it apart. Take this brick barrel ceiling. It's unexpected. Paired with the sleek kitchen appliances and neutral finishes, the ceiling takes the spotlight and becomes the focal point. When it comes to a bathroom, the typical flooring choice would be tile. But, to add a unique touch, incorporate textured stones or pebbles into the overall flooring design. 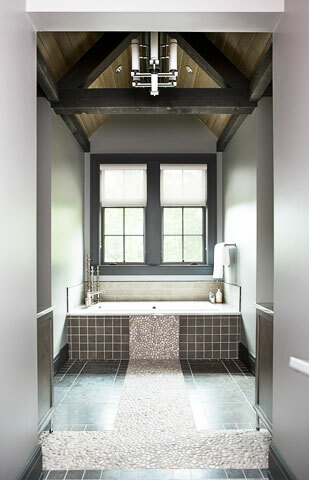 The ruggedness of the stones makes the bathroom more warm and engaging and also adds a unique dimension to the current neutral color palette. In some cases, contrasting textures can be be paired together to create additional visual interest. Take this dining area. 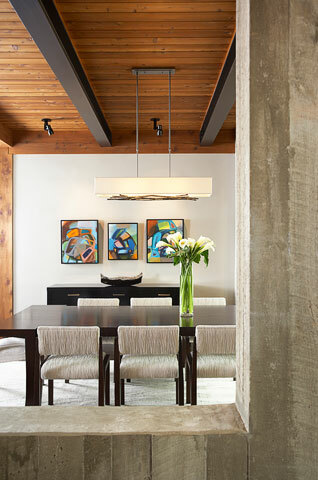 The smoothness of the concrete pillars combined with the rough wood ceiling beams helps balance out the space. Even with the concrete elements, the room still feels warm through the use of the wood planks. Due to the concrete's smooth texture, it makes the space feel lighter, even though concrete itself is heavy. Subtle texture additions can also be beautiful. The addition of the wood planks along the wall and ceiling in this sunroom adds visual depth to this monochromatic color palette and also a touch of warmth. It's not overtly obvious but enough to change the feel and look of the room. What are your thoughts on texture? Do you prefer the warmth of more rugged surfaces or do you love the look of clean smooth lines? If you like the look of this elegant sunroom from our own Linda McDougald's home, we're showing you how you can get the look yourself in our Designers' Corner section of our online boutique this month. Learn how you can purchase a similar rug, furnishings and accessories used in this room.